If you have cracks, chips or other damage to your windshield, scheduling a repair as quickly as possible can help you restore visibility and to improve the structural stability of your vehicle. Deciding whether to have your Houston windshield replacement performed in a shop or to schedule mobile services can be challenging. Here are some points to consider when making this important decision about your windshield repair or replacement. Whether you take your vehicle into the shop or schedule mobile windshield replacement in Houston, the process will typically take about an hour. You will need to allow about two to four hours after the replacement is complete, however, to give the urethane adhesive time to cure. Many auto glass repair shops recommend scheduling your replacement in the morning to ensure that your car or truck is ready to go by the end of the working day. Outdoor weather conditions can have an impact on the time and effort needed to complete a windshield replacement or windshield repair in Houston. High humidity, extreme temperatures, wind, and rain can make it more difficult for your glass technician to perform high-quality work outdoors. In inclement weather, it is usually a good idea to take your vehicle to the shop rather than requesting mobile service. This can ensure the best possible results for your Houston windshield replacement or repair procedure. Because most mobile windshield replacement and repair services can be performed at a location of your own choice, you can enjoy the greatest possible convenience when scheduling these repairs for your vehicle. 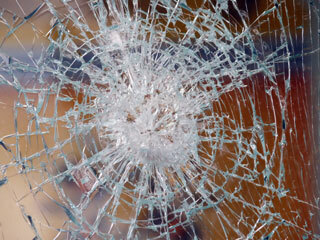 In many cases, your vehicle’s windshield can be repaired or replaced while you are at work during the day. This can help you to manage your time in the most effective way while ensuring that you stay safe behind the wheel. Your windshield provides important structural support for your vehicle. Taking the time to repair any cracks or damage can ensure that this component of your car or truck provides optimal protection if you are in an accident. By repairing or replacing your windshield at the first opportunity, you can enjoy clear visibility and a safer journey on Texas streets and highways. The auto glass experts at Apple Glass can provide mobile and in-shop Houston windshield replacement and repair services for all types of vehicles. Our highly trained and skilled glass technicians can provide high-quality solutions that work with your schedule and your budget. If you need the best mobile or in-shop windshield repair in Houston or the surrounding areas, call us today at 713-680-1400 in Houston or 281-296-0600 in The Woodlands to schedule an appointment today. We look forward to the opportunity to serve you. This entry was posted in Auto Glass Repair, Mobile Windshield Repair, Windshield Repair and tagged Houston Windshield Replacement, Windshield Repair in Houston, Windshield Replacement in Houston. Bookmark the permalink.